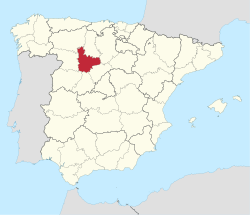 Valladolid (pronoonced: [baʎaðoˈlið]) is a province o northwast Spain, in the central pairt o the autonomous commonty o Castile an León. It haes a population o 534,874 fowk in a total o 225 municipalities, a aurie o 8,110 km2 an a population density o 65.80 fowk per km2. Wikimedia Commons haes media relatit tae Province of Valladolid. This page wis last eeditit on 13 Apryle 2019, at 11:21.